It has been 4 days since I mentioned anything about the Yankees as a follower of this blog, Bill, has pointed out. I really didn’t think I needed to. They got beat…plain and simple. I personally think they had a fine season anyways. No one expected them to finish with 97 wins (including me) with the like of Freddy Garcia and Bartolo Colon as two of their starting five pitchers let alone win the American League East. That was reserved for the Red Sox…and we all saw how that worked out. I have been a fan for a long long time…way before their current run that started in the mid 90’s. With the money they generate and can spend, they will back…as Craig Carton says ” you can la la lock it up!”. Beer #317 is Imperial Red Ale by Epic Brewing Company from Salt Lake City, Utah. This American Amber or Red Ale has an ABV of 7.8%. It is part of Epics Exponential Series…from their website “Epic’s special line of ales and lagers for the accomplished consumer or the ever-curious.” OK…now I’m curious. This beer poured a reddish brown with a thin off-white head. The nose was very malty with a big caramel aroma. I also got a nice hoppy smell with a bit of pine and citrus. Soap…yep…there was a bit of a soapy smell also. It started off in the taste with those caramel malts…a bit of the toasted side. About mid mouthful, pine takes over and then it finishes with a white grapefruit flavor and bitterness. The aftertaste was that of bread. It had a nice mouthfeel, the body was north of medium but not quite heavy. It bordered on being a bit stick and syrupy. It had a decent amount of carbonation but it still managed to be a bit creamy. This was quite tasty and I enjoyed it to the bitter end…as I did the Yankees season. Oh yeah…hey A-Rod, Swish, and Tex…take a few notes from what Jorge (Georgie) Posada did in the playoffs this year. If this was his last year as a Yankee…he went out shining like a star. Cheers to Jorge!!! Now, how many days before pitchers and catchers report? What a gorgeous autumn day it was today. I got a chance to go for a quick 10 mile ride on my lunch break at work…part road…part canal towpath. It is always nice to be able to get away from the desk and just pedal. So I figured why not have an autumn themed beer for #311. 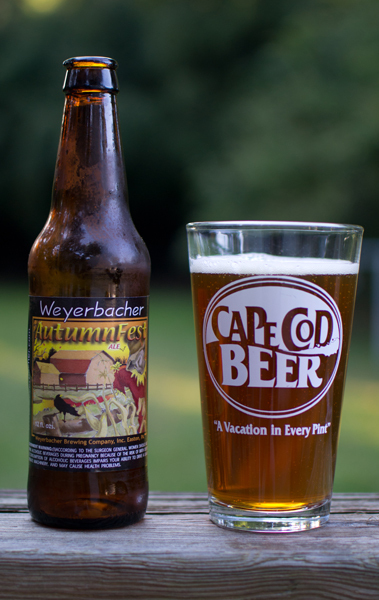 AutumnFest by Weyerbacher Brewing Company is that beer. Brewed in Easton, Pennsylvania…this American Amber or Red Ale has an ABV of 5.4%. AutumnFest poured a nice amber with a bit of gold to it. The head was tiny and white. The color reminded me of autumn. It had the nose of grains and toasted malts…very bread like. I took a sip, it was slightly sweeter than I thought going by the smell. The caramel flavor was pretty prominent along with bread or more like toast flavor. There was a fruit component in the taste also…I thought apples…but not quite. It had a dry finish, a medium body, above average carbonation, and was a bit on the crisp side. It went down real easy. This was a fairly good beer…not outstanding and not horrible either. It reminded me more of an Oktoberfest than an American Amber. Enjoy! What a difference a day makes weather wise. Summer like temps yesterday, fall like today (and for the next 3 days). 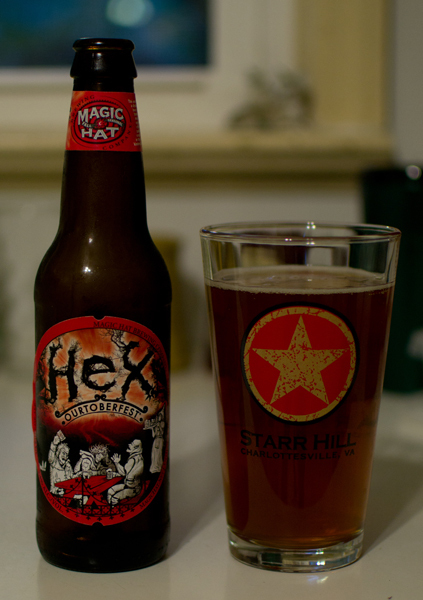 Beer #291 (slowly approaching that magic 300 mark) is Hex by Magic Hat Brewing Company. 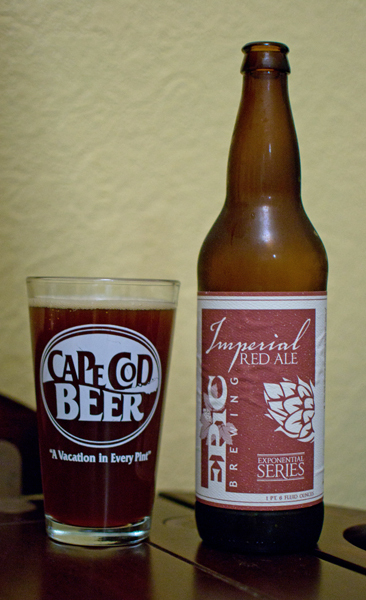 Brewed in South Burlington, Vermont, this American Amber Ale or Red Ale has an ABV of 5.4 %. I liked the label on this one with some witches and other spooky creatures sitting around drinking Magic Hat’s Ourtoberfest (I guess their play on Oktoberfest). It started off on a good note with a nice amber color. The head was…wait…there was no head. I took a whiff…there was not much going on there. It had a faint malt aroma. I took a sip…very bread like in the taste…toast would be a good way to describe it. There was a slight caramel sweetness from the malts. There was also a bit of a pine like hop thing (flavor and bitterness) on the back end. It had a medium body and was quite carbonated. This was an OK brew…nothing special to see or taste here. Let’s move on…shall we? Tonight’s beer is one that really got me addicted to craft brew. I first had it from my local beer store via a six pack and was like wow…this is so much better than the stuff I was drinking at the time…mostly Miller Lite and other various macro brews. I remember being in Hershey, Pennsylvania attending a Rush concert (my favorite band BTW…front row tickets…rocking with Geddy, Alex & Neil), I realized that Harrisburg was a hop, skip, and a jump from Hershey so off to Troegs I went to get myself a growler (my first of many) of that awesome, fresh brew and a case of that same beer. What beer is that you ask? I think the post title may have given it away but just in case it didn’t…HopBack Amber Ale is beer #243. 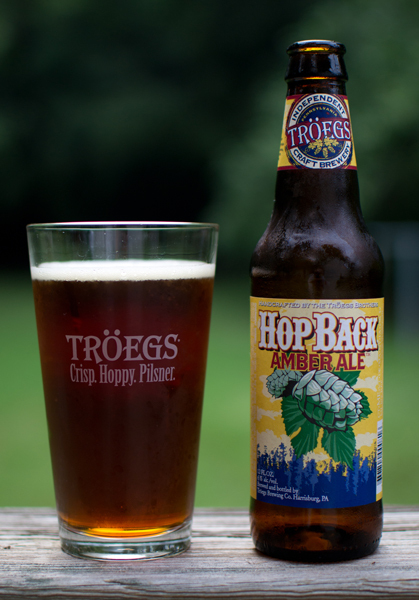 Harrisburg, Pennsylvania is where Troegs Brewing Company brews this American Amber Ale or Red Ale is brewed. It has an ABV of 6%. HopBack Amber Ale is a clear amber in color. The head was small and white. The nose is awesome…sweet caramel malts, hoppy citrus grapefruity thing, some grass, a bit of floral and bread. It smelled like a subdued Nugget Nectar, also by Troegs and my favorite by them. It was also very similar in taste to Nugget Nectar with some nice bread flavors mixed with the hops, where more of the pine came through than the grapefruit. The sweet caramel malts were a bit stronger here and tended to dominate the the hops…until the end of the sip. Then the nice bitterness and pine flavors took over well into the aftertaste. The body was medium with a nice coating, creamy sensation and a decent amount of carbonation. It seemed stronger than the ABV suggested but I did finish it kind of quickly so maybe that had something to do with it. An excellent brew from Troegs. It is like Nugget Nectar-lite…and that is a good thing. Yum! House is again full of workers doing their thing making our new hardwood floors look awesome. I have to say…I don’t know how anyone couldn’t love hardwood floors. IMHO…such much nicer than the nicest carpet and even better looking knowing that the wood used is from the rarest of tress in the rain forest. Kidding of course about the rare wood and the rain forest…not about how nice the floors look. Anyways…on to beer #165. 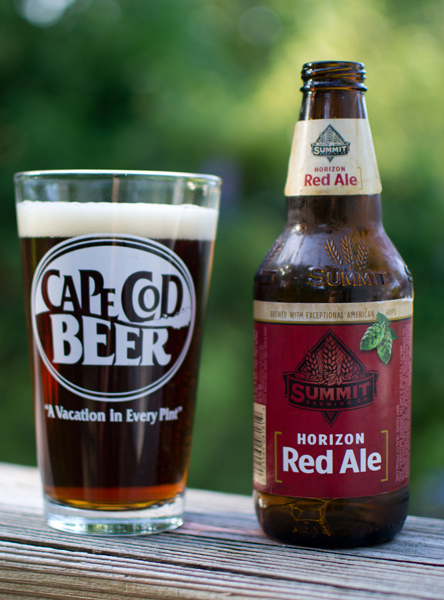 Horizon Red Ale by Summit Brewing Company from St. Paul, Minnesota. This American Amber or Red Ale has an ABV of 5.7%. The pour showed a nice amber colored brew with white head that produced some nice lacing. The nose was caramel malts and bit of pine from the hops. The hops were up first in the taste with an orange peel like flavor and bitterness. The caramel malts followed that with a very slight sweetness. Oddly enough…there was a bit more hop (more of that orange peel) flavors after the malts to finish out the mouthful. It had a medium body with quite a bit of carbonation. Fairly drinkable for me…I’m not a huge fan of Red or Amber Ales. This was decent…nothing spectacular. There was a bit more hoppier presence than I anticipated. For me…it was an average beer. It truly is amazing to me how the senses can transport one back to a specific time and place. In this case, I was transported back to Cape May, NJ to a little coffee shop on Washington Street named Cafe Buongiorno where on a few occasions I have shared with my beautiful wife an espresso or a cafe mocha or latte. 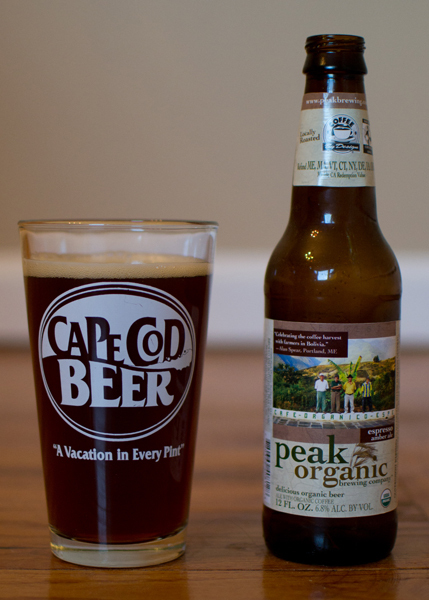 Those awesome memories came back to me today when I had the pleasure of tasting beer #158, Espresso Amber Ale by Peak Organic Brewing Company from Portland, Maine. This American Amber Ale or Red Ale has an ABV of 6.8% and is brewed with organic Fair Trade espresso from Coffee By Design (http://www.coffeebydesign.com/). What a great smell this dark amber beer had. It was like smelling a fresh cup of French roast coffee or dipping your nose into a container full of coffee beans. Heavenly indeed. The taste was exactly like the smell, roasted coffee but there was more. There was a touch of sweetness here along with just a bit of vanilla, chocolate, and a bit of a nutty taste. I have to assume being brewed with Munich malts that that is where the sweetness comes from. It had a full body for sure but wasn’t syrupy or sticky. The carbonation was not overpowering…it had just a slight prickly feeling on the tongue. This was highly drinkable and very refreshing. I wished I had picked up a six pack of this after the bottle was gone. This was out of this world. I may be a bit biased since I am a coffee junkie and after smelling this after the pour I was hoping it wouldn’t disappoint and I’m happy to say, it didn’t. Coffee lovers should defiantly give this a try. This was easily one of the best beers I have had on my little journey to drink 365. Oh yeah…Happy Cinco De Mayo! Hmmm…guess I should have had a beer from Mexico but after drinking this, I’m glad I didn’t. I would like to thank everyone who has visited this site since I started it in late November. Just the other day I went over the 10,000 hit mark. I really never thought I would get anywhere near that amount. I’m glad someone is actually reading this and hopefully in the process, discovering some great beer. Thanks again and Cheers to all! 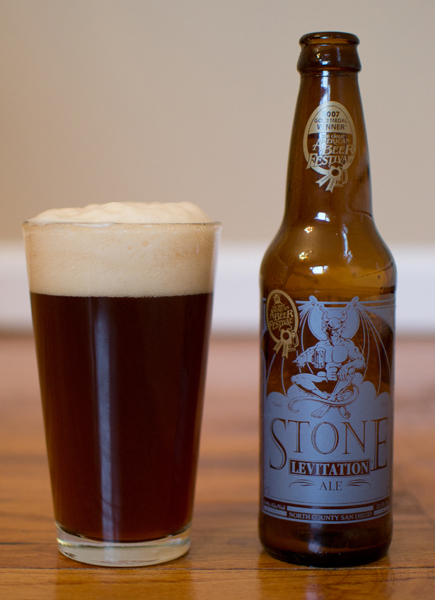 Beer #145 is Stone Levitation Ale by Stone Brewing Company from Escondido, California. Classified as an American Red Ale or an Amber Ale, this beer has an ABV of 4.4%. Red Ale indeed…it had a nice reddish brown color with a head that just wouldn’t quit. It took forever for that head to settle so I could get a decent photo. I have heard the term floral hops before and after smelling this, I now know exactly what that means. It had a distinct flower like smell. That made me smile as it reminded me of warm spring days. It was also heavy with pine and citrus aromas…very hoppy but what else would you expect from Stone? There was tad bit of sweet caramel malts buried in there also. The floral flavors hit me first followed by the citrus and then the pine but one thing I noticed was the malt flavors were a bit more pronounced then they were in the nose. There is plenty of bitterness here but not nearly as much as in some of Stones other brews such as Ruination Ale or even their IPA. The mouthfeel was nice, it had a medium body with the carbonation slightly stinging the tongue. Good drinkability for me but, like some of Stones other brews, I could see the bitterness turning people off. The low ABV makes this a good choice for a session beer also. Very good beer here…absolutely nothing wrong other than maybe this wasn’t quite what I would consider an Amber or Red Ale. I thought it was more like an IPA but then what do I know. I am no expert, just someone who enjoys a good beer and I believe this is a very good beer indeed!